Catherine Ndereba is a Kenyan marathon runner. She has twice won the marathon at the World Championships in Athletics and won silver medals in the Olympics in 2004 and 2008. She is also a four-time winner of the Boston Marathon. Ndereba broke the women's marathon world record in 2001, running 2:18:47 at the Chicago Marathon. In 2008, Ndereba was described by a Chicago Tribune sportswriter as the greatest women's marathoner of all time. 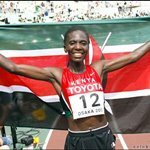 Ndereba is from Gatunganga in Nyeri District, and went to Ngorano Secondary School where she pursued her running career. In 1994, she was recruited into its athletics program by the Kenya Prisons Service. Ndereba was awarded the 2004 and 2005 Kenyan Sportswoman of the Year awards. She was awarded the Order of the Golden Warrior by president Mwai Kibaki in 2005. Ndereba finished seventh at the 2009 London Marathon, equalling Katrin Dorre's record of 21 sub-2:30 hours marathons. She placed third at the Yokohama Marathon later that year, finishing the course in a time of 2:29:13 hours. She did not manage to finish another marathon race until October 2011, when she crossed the line in 2:30:14 hours for third at the Beijing Marathon. Ndereba, whose nickname is 'Catherine the Great', currently lives in Nairobi with her husband Anthony Maina and daughter Jane. Her brother Samuel and sister Anastasia are also marathon runners.